The past couple of days we’ve been lazy, so we just heated up some frozen food (potstickers one night, breaded chicken another) and topped them with some teryiaki sauce. Because both of those meals were ‘asian’ I told Nate we had to to Mexican or Italian last night. We decided upon Italian, but we wanted something new. Now, I can’t say this recipe is VERY Italian, but anything calzone/pizza is close enough in my book. Plus, even if this isn’t “Italian” I promise you’ll love it, nonetheless. 3. Cook the chicken for about 15 minutes (until inner temperature is 165), chop into 1 inch pieces when cooked. 5. Combine ranch dressing and chopped garlic in a bowl and stir. 7. Roll each section into a circle, about 10 inches. 8. Top 1/2 of each circle with garlic ranch dressing. 9. Cover garlic ranch generously with cheese. 10. Top with chopped chicken and crumbled bacon. 12. Crimp edge over itself a little and pinch closed. 13. Make 3 slits on top of dough with knife (so the hot air can be released). 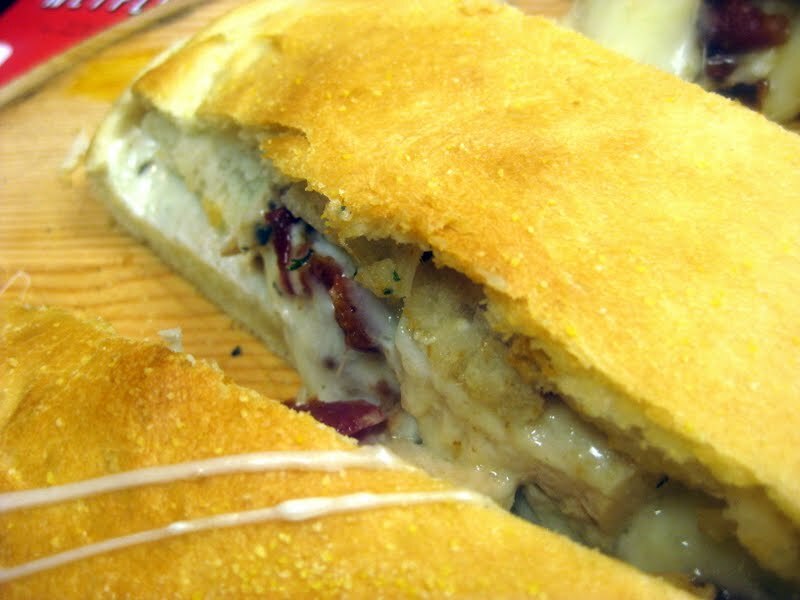 **If you don’t like calzones, you could always just make these into pizzas instead. If you like tomatoes, these calzones would probably taste great with them. Warning, these calzones were VERY filling. We cut one of the calzones into 6 slices and we each only ate 2. We saved some for Sunday lunch and froze the rest. So we’re hoping it tastes just as good reheated. But seriously, this turned out to be so good. Nate gave this meal an A+, and I HAVE to agree. Like, oh my goodness good. Pizza is always one of my favorite meals, and this type will have to be added to the regular rotation. What’s YOUR favorite type of calzone/pizza? We are trying this today – in the oven as I type! Oh my goodness this sounds amazing! These are some of all of my favorite ingredients rolled into one! That sounds amazing! We'll have to try these!